Order your Fishman Aura Pro Pickup System Wide Format from AMS and enjoy 0% Interest Payment Plans, Free Shipping, Free Extended Warranty & 45 Day Money Back Guarantee. 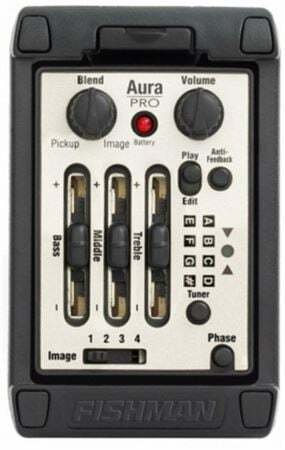 With the success of Aura Imaging Technology, guitar manufacturers asked Fishman to develop an Aura system that could be built into their top-tier acoustic-electric models. The Aura Pro is that product, and is now available to players everywhere. Onboard Aura systems include Fishman’s Aura Image Gallery software, a PC/Mac compatible application that allows users to access Images for hundreds of guitar makes and models through our free Aura Image library. Once installed on your PC or Mac, the software also allows Aura Images to be sorted, managed, and grouped. Users can then take advantage of the preamp’s open architecture by loading Aura Images via a USB cable.